Autoimmune disorders are among the trickiest types of conditions to diagnose, and psoriatic arthritis is no exception. There aren’t any blood tests that can identify this form of arthritis, which causes inflammation of the joints, skin, and nails. 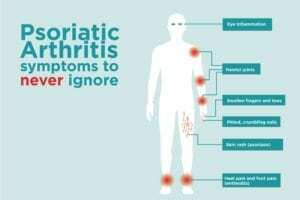 To complicate matters, some doctors don’t always consider a diagnosis of psoriatic arthritis (PsA) because they may be looking for joint symptoms associated with rheumatoid arthritis. Here, she shares the signs the doctors should be looking for when considering a diagnosis of psoriatic arthritis. Most people experience this symptom for an average of seven to 12 years before the onset of psoriatic arthritis. Overactivity of the immune system speeds up the life cycle of skin cells, causing a buildup of rough, dead skin. The result: Red patches of skin with silvery scales called plaques. While plaques are often quite noticeable and may cover large areas of the body, that’s not always the case. Plaques can appear anywhere on the body, but other common spots include the elbows, knees, and around the ears. It’s estimated that up to 30 percent of people with psoriasis will develop psoriatic arthritis. Psoriasis can also affect the fingernails and toenails, causing them to separate from the nail bed, develop pits, and appear thick and flaky. 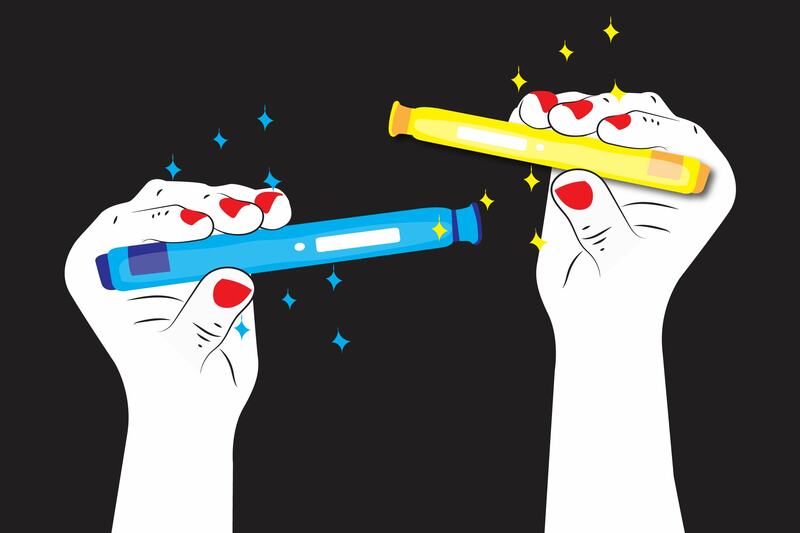 It’s generally considered that people with psoriasis who experience these nail changes are more likely to develop PsA that those with no nail involvement, according to Dr. Ogdie. This condition, called dactylitis, is another symptom of psoriatic arthritis that tends to appear in the early stages of the disease. Toes and fingers swell to the point that they appear sausage-like, and are red, tender, and painful to bend, Dr. Ogdie says. The presence of dactylitis is one of the symptoms that sets psoriatic arthritis apart from rheumatoid arthritis. Like people with rheumatoid arthritis, those with psoriatic arthritis experience achy, swollen, and stiff joints, though usually just on one side of the body. (With rheumatoid arthritis, the pain is more likely to be symmetrical.) The pain from psoriatic arthritis is worse in the morning or after resting. Any joint may be affected by PsA, but it’s most common in the large joints in the lower extremities, like the knees and ankles. People with psoriatic arthritis can also experience back, hip, and shoulder pain —symptoms it shares with other conditions called spondyloarthropathies, which include ankylosing spondylitis and reactive arthritis. Rheumatoid arthritis, unlike PsA, isn’t categorized as a spondyloarthropathy, so pain in these areas helps distinguish between the two diseases. 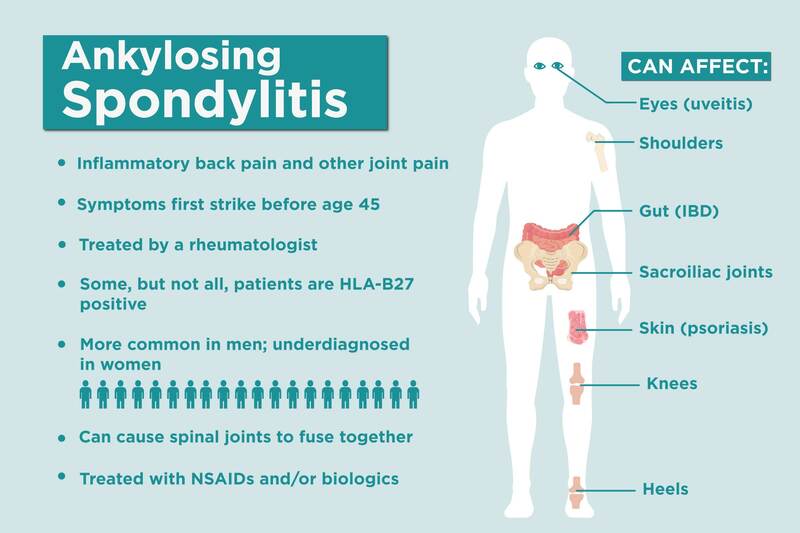 Read more about ankylosing spondylitis symptoms here. In addition to attacking the joints, psoriatic arthritis also causes pain and tenderness where ligaments and tendons attach to the bones, which are called entheses. The two most commonly affected spots are the Achilles tendon and the plantar fascia, which causes pain at the back of the heel and the sole of the foot. People with psoriatic arthritis are at higher risk of developing an inflammatory eye condition called uveitis, which causes eye pain, redness, and blurry vision. However, this is more common among children with psoriatic arthritis, Dr. Ogdie says. Even though there aren’t any blood tests that help identify psoriatic arthritis, your doctor will test for some markers of inflammation — such as rheumatoid factor — to rule out RA and other types of arthritis. Imaging tests such as X-rays and ultrasounds are also used to detect changes associated with PsA, such as new bone formation and inflammation in the capsule of the joint and attachment points of the tendons and ligaments. If you have previously undiagnosed psoriasis, your doctor may also take a skin biopsy of a skin plaque to make the diagnosis. The presence of dactylitis and fingernail and toenail changes also factor heavily into establishing a diagnosis of psoriatic arthritis. If you’re experiencing symptoms of PsA, it’s very important to see your doctor as soon possible. While there’s no cure for psoriatic arthritis, there are several treatment options available, and most people will gain some benefit from them, she adds. Some commonly used medications are NSAIDS (such as ibuprofen) and disease-modifying antirheumatic drugs (DMARDs), which can slow or prevent tissue and joint damage and the progression of PsA. For those who don’t respond, a subset of DMARDs called biologics may be recommended, which are usually given by infusion or injection. Topical treatments to manage psoriasis symptoms include retinoid and steroid creams, prescription vitamin D creams, and over-the-counter or prescription salicylic acid creams, gels, and shampoos.